I was struck by this all over again at the weekend when a friend let me play around with her phone. My friend’s not a tech-head but she’s a pretty switched on sort of person, uses the internet all the time and uses cameras for work. Anyway she had no idea her Samsung i5700 Galaxy Lite phone was on Android, didn’t know what Android was and didn’t know that she could buy apps with it. Comparatively she did know about iPhone and several iPhone apps, even though she didn’t have one. Considering what a big deal techies make out of operating systems, it’s interesting how little attention customers pay to them. 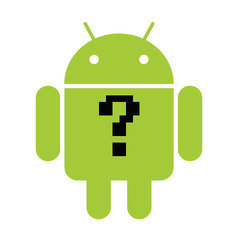 Android is great, but even people who have it don’t know what it is. Obviously, this doesn’t hurt Google. Android phones just outsold iPhones in the US and even if half of those customers don’t know what they’re buying, Google is still shifting Android units. But it does in my opinion point to a PR failing on Google’s behalf. Largely, they don’t have to bother much with advertising – their search engine and gmail services have both been huge successes simply because they’re great and spread by word of mouth. Sometimes Google do push the boat out and buy out paper ads and TV time to advertise things like their new browser, Chrome – with success. People mention Chrome to me a lot. Not always in a way that suggests they know what they’re talking about.. but still, the name recognition is there. Whereas stuff like Buzz is an example of when Google put out a good product, rely on word of mouth and but none of the general public have a clue what’s going on and they fail to come up with a compelling narrative that makes their products seem useful. Or even memorable. By contrast Apple PR is a well-oiled juggernaut. Of course the iPhone story is easier to tell than the Android story. There’s only one iPhone and there are dozens of Android phones. When hardware, manufacturer and network are all different it can be hard for consumers to grasp that what’s on the inside can be the same. Still, considering the amount of money people have to spend on their phones these days, phone companies and tech companies have got to start educating people more about what they are buying into. I’m a bit sceptical – we’ve all been using computers for several decades now, so I find it a bit hard to believe that people don’t know what an ‘operating system’ is. Also, your analogies are slightly broken – iPhone is a physical thing, whereas Android is the OS. But yes, I agree with your point about dozens of phones running Android and only the iPhone being on iPhone OS. But doesn’t this mean that Google doesn’t need to make Android popular? Because the handset manufacturers will do it? I suggest it is Googles arrogance that they will not advertise Android on TV, and it’s ‘more money than brains’ approach which led them to launch Nexus One. On the other hand, even now in the UK we are only just beginning to see a mention of the word ‘Android’ in TV Ads, (namely Sony Xperia X10 mini). Blame must also be put at handset and network providers doors for not pushing it more. One other thing… Whilst there are some amazingly powerful Android handsets out there, I do not think that there has been a ‘gob smackingly’ gorgeous looking or radical design Android based handset yet? To my mind the best looking has to be Lenovos’ LePhone and we’re not likely to see it in the west. Square phones are not the way to go Motorola! Why oh why do these companies not go with some of there concept designs? Pull your fingers out and give people what they want! (Don’t get me started on the HTC Wildfire.. Looks stunning in White/Silver, why the hell put such a crap display in it, when it has everything else going for it?, The Desire has enough clout to differentiate itself and justify it’s higher price tag and the component cost difference would have been minimal.If HTC change the display I seriously believe it would be the choice of the younger generation, better than an Iphone 4 in many ways, but without the ridiculously high price). Still it’s pretty impressive that it has got this far in such a small time frame. And I for one will always champion Googles Android over the ‘sterile’ design and functionallity of other mobile OS’s out there.